Now I get it why my parents were SO worried to let me go to Istanbul. Maybe they concerned more about the Turks not bomb attacks, but still. And now I also get why my Turkish friends were telling me that ANYTHING can happen in Turkey. I was just having pancakes for breakfast with my flatmate (my first cooking in Turkey), when my Turkish friend called me if I am fine. I couldn’t understand why he is asking such a question in this lovely Sunday morning with sunshine and 18°C outside. Then he told me there was some suicide bomb attack in Istanbul, in the main square Taksim and fifteen people were injured. WHAT? Now I get it why my parents were SO worried to let me go to Istanbul. Maybe they concerned more about the Turks not bomb attacks, but still. And now I also get why my Turkish friends were telling me that ANYTHING can happen in Turkey. 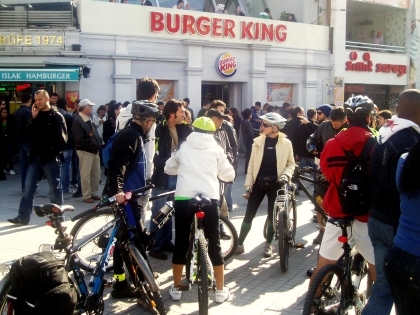 You’re eating pancakes in sunny morning and two and half kilometers from your apartment twenty two people (ok, new update) are hurt due to bombing in the most famous place in Istanbul. 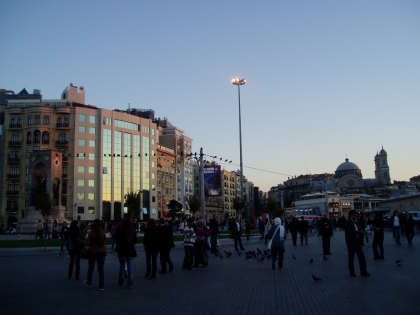 Taksim square, guys, come on, I go there every day, my shuttle bus to school leaves from this square, “in Taksim in front of the Burger King” is the meeting point for all people in Istanbul, like in Prague “at the horse” – near the statue of St. Venceslav in the Venceslav’s square or “under the clocks” – at the beginning of Ceska street in Brno. I have friends who live close to the Taksim square, I’m supposed to go to Taksim tonight with my Turkish classmates, everything happens in Taksim. Now Taksim square is closed. The attack was carried out by a male suicide bomber who was killed in the blast. He attempted to enter a police bus and detonate the bomb inside, but the explosives went off earlier. My second flatmate went to Izmir for this weekend so a moment ago I received a message from him asking where I am and if I am OK. I’m at home but I’m not OK. 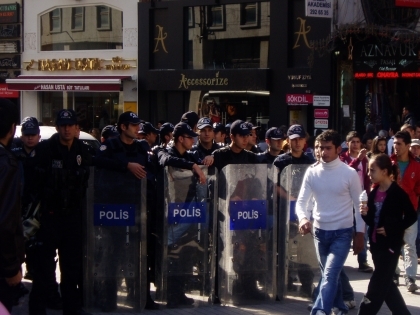 I thought Turks are really paranoid when they put almost one hundred secret policemen around Taksim square to monitor the situation because of a possibility of a terrorist attack. I found the possibility so low I was more afraid of these secret agents than real terrorist. Now I see. Explosion rocks central Istanbul. Television pictures from Taksim square showed body parts lying on the ground. While hundreds of Turkish flags are hanging around the place because of the Friday’s 87th anniversary of the foundation of the Turkish Republic. The place where the bomb attack happened. Now I should add something like I hope that this is the closest I will ever get to bomb attacks. But I don’t. After all, I haven’t chosen Turkey by accident. Bad events happen every now and then. I guess more than 22 people of 12,8 millions Istanbulians get hurt in traffic accidents, however this does not prevent us from using cars and buses. Let’s pretend those things won’t happen to us, that is all we can do about it. There are bad events happening by accident and bad events happening on purpose. Of course you can’t influence any of those, but still the second one (like the attack) is somehow much more alarming.